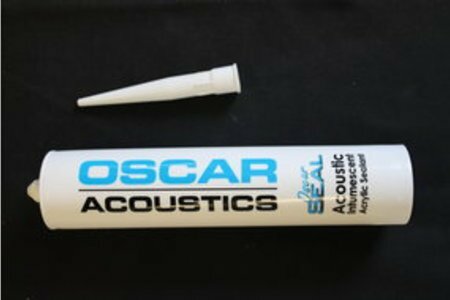 Oscar Acoustics has its own intumescent acoustic sealant called Oscar Seal to complement its ever growing range of soundproofing and reverberation control products. Oscar Seal intumescent acoustic sealant is a high density, flexible, paintable halogen free sealant that provides up to 4 hours fire barrier combined with excellent sound damping properties. Ideal for sealing irregular or uneven gaps around service penetrations, door casings and sills, sealing fire protection boards and partitioning, or use with our Oscar Iso-Mount space saving soundproofing system and our heavy duty SonaCel soundproofing system. Now you can purchase all your acoustic needs in one place from us, the acoustic experts with over 40 years’ experience. Oscar Iso-Mounts - space saving acoustic hangers for soundproof ceilings. Oscar Seal acoustic sealant - high performance acoustic sealant with fire rating. Celbar - recycled acoustic thermal loose void fill. Oscar Foam - acoustic fire rated seal to block noise vibration path into new soundproof walls & ceilings. Oscar Intumescent Sealant is a halogen free, polymer emulsion based sealant that swells when subjected to temperatures in excess of 125oC and forms a char coat that restricts the passage of smoke and fire. It is easily applied and dries to a flexible and smooth surfaced material which is readily over paintable. It has excellent adhesion to a wide range of substrates and will not harden or crack with age. BS EN 1366-3: 2004 & BS EN 1366-4: 2006 Tested at Bodycote Warrington Fire, report No. 173658A achieving up to 4 hour integrity and insulation rating for a range of linear and penetration seals. an indicative fire test based on BS476 Part 20 at Warrington Fire Research and achieved up to 4 hour fire rating (integrity) for a range of vertical and horizontal joints up to 35mm wide between various non-combustible construction materials. A 1 hour fire rating (integrity) was achieved for a range of vertical joints up to 25mm wide between combustible materials (timber). BS EN ISO 140-3. 1995 Measurement of Airborne Sound Insulation of Building elements. Oscar Intumescent Sealant forms a fire and smoke seal in joints up to 35mm wide without slumping. It is ideal for sealing joints in and around internal partitions, lap joints in fire-rated cladding and for sealing between fire doors and fire-rated walls. It is recommended that a sealant depth of at least 8mm be applied. If the sealant is to be overpainted, building regulations may require a fire resistant coating. Oscar Intumescent Sealant is not suitable in joints where movement exceeds ± 7.5% of joint width, or in external joints. Skinning Time: 15 mins to 1 hour depending on conditions. Cure time: 5 to 15 days for 15mm X 20mm bead. Cleaning: Uncured sealant with water. Shelf Life: min. 18 months when stored in unopened containers as recommended. To achieve a high quality joint, clean all surfaces, remove dust and ensure surfaces are dry. Non porous surfaces should be degreased using a suitable degreasing agent. Highly porous surfaces should be sealed with a suitable primer. Apply masking tape to each side of joint and gun sealant firmly into joint, smoothing off with a wetted spatula. Masking tape should be removed within 10 minutes of application. 1 tube is sufficient to produce approx. 1m using a 20mm x 15mm bead. Store in cool dry conditions. PROTECT FROM FROST. Oscar Intumescent Sealant presents no known health hazards when used as recommended. Consult Health and Safety data sheet for further information. As with all chemical product, care should be taken during use and storage to avoid contact with foodstuffs, skin, eyes and mouth. If accidentally ingested, seek medical attention do not induce vomiting and give copious amounts of water to drink. This acrylic intumescent acoustic sealant is a ready to use sealant that is ideal for sealing uneven or irregular gaps around service penetrations, sills, door casings also for sealing fire protection boards and partitioning. Use to seal low movement construction joints where fire rating is required. Can be used to seal joints up to 35mm wide for excellent building acoustics. Surfaces to be sealed with acrylic intumescent acoustic sealant must be clean, dry and free from dust, dirt, frost, grease and other contamination. Cut both the cartridge tip and applicator nozzle to the required diameter and angle, screw nozzle onto cartridge. Apply sealant with applicator gun ensuring good surface contact is achieved by forcing sealant into the joint to be sealed. If necessary, tool within 5 minutes of application using a spatula dipped in soapy water, apply sufficient pressure to ensure good contact of the sealant against the joint surfaces. Clean tools with water immediately after use. Wash hands after use. Store Oscar Seal intumescent acoustic sealant in a cool dry environment, product can be stored for at least 18 months from its production date in original unopened container, at temperatures between +2C and +30C. Do not allow to freeze. One Cartridge of Oscar Seal acrylic intumescent acoustic sealant contains sufficient material to seal 4 metres of a 12mm x 6mm joint. Oscar Seal acoustic sealant is not be used in applications subject to permanent water immersion. It is always the user’s responsibility to determine suitability of use. It is not recommended for use in areas subject to abrasion. Avoid contact with skin and eyes. In case of contact with eyes, flush immediately with water and seek medical advice. Wear suitable protective clothing and gloves. Keep out of reach of children. Do not ingest.